Hi Friends! I’m back for another guest post for “Passport Pals” with Frenchie. The project I’m sharing with you today is from my recent “Wine and Craft” Girls Night. On the last Saturday of each month my friends and I get together for wine and appeys and we create projects from Pinterest. I was inspired by the framed chalkboard art (I just LOVE it) but I decided to add a little twist to the project. Instead of a frame, I purchased charger plates from the craft store. Then I made a mask using some newspaper and sprayed the center with chalkboard paint. I did this three times, to make sure I got a good coverage of paint. My Digital Studio worked perfectly for the designs. I used snowflakes from a variety of digital downloads, as well as the “Free For You From Us” download. To create the design in MDS, I opened a new project and added a circle punch. I measured the centre of my plate and enlarged the circle punch to size. Then I added the elements within that circle. Once done I exported the image to my desktop and printed it out on regular computer paper. Next, I cut out the circle and rubbed chalk on the backside of the image. Then I placed the image, chalk side down, onto the charger plate and traced the design with a pen. Once the design is completely transferred to the plate it’s time to fill in the art work with your chalk. The chalk pen (#132133) from Stampin’ Up! also worked much better than regular chalk (it’s important that you’re using the right kind of chalk for the chalk paint – it does make a difference). If you use chalk make sure to spray a light coat of hairspray over top to ‘set’ your art work (it will still be erasable though). I wanted my art to be permanent which is another reason why I chose to use the chalk pen – and it just worked like a charm. This was my first go at this kind of chalkboard art so there is certainly room for improvement but I thoroughly enjoyed making it. I am going to make more of these plates for gifts – thank goodness they don’t take long to make (I can’t believe Christmas is less than a week away!). Instead of making Christmas plates though I’m going use other digital downloads to create chalkboard art that can be used year round. There are so many fun possibilities of what you can do with this technique and charger plates! Have a wonderful Christmas everyone. I hope the spirit of the season fills your heart and home with light and love and may all your dreams come true in the coming year! P.S. – Don’t forget to scoot on over to my blog at www.serenestamper.com to see Frenchie’s Passport Pals project too! I hope you are planning a video for this charger plate. It is very lovely! But I am a visual learner and a video would be most helpful. Hi Nancy! Thanks for your kind comment! 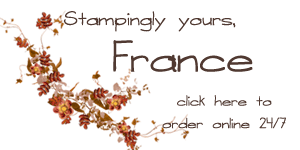 I am uploading the video now – it will be posted on my blog http://www.serenestamper.com HAPPY STAMPING!